Campion Sales would like to invite you to our Top Golf Events. These FREE events are held for our top clients showcasing the latest technologies. Don't miss the fun, food, golf & giveaways! Register now to guarantee your seat. Pass this on to anyone you think would be interested in the event and have them register as well. Call 972.471.3466 or email Kace at kace@campionsales.com for more information. CALL: 972-471-3466 | REGISTER ONLINE NOW! Siklu is announcing the General Availability of the latest EtherHaul™ 8010FX software, R10.2, and of the AES model, delivering an impressive and important set of new features. These features make the migration to 10Gbps very simple by increasing where and how the leading 10Gbps mmW links can be deployed while enhancing the robustness of your network. Join us and learn how Siklu’s EH-8010FX latest advanced features can benefit your deployment:. OnSSI is offering a three-day Ocularis 5 VMS certification training class in your area that will provide you with the knowledge and skills to be able to seamlessly install and support Ocularis 5 Professional, Enterprise, and Ultimate. Space is limited, so sign up today to secure your seat! Ocularis 5 certification is valid for two years. Please contact OnSSI Training at 845-732-7900, Option 4 or Training@OnSSI.com with any questions you may have or to check your certification status. If you're new to Security and Surveillance Technology or you're a seasoned veteran, our professional team can match you with the right products and provide you with expert training. At Campion Sales we are committed to improving every aspect of your security project, from CCTV cameras to storage servers and IP networking. Visit our partners - contact us today. We are a new breed of manufacturers representative! Campion's professionals can help you find the AV solutions you need. Remove the complexity of system design by consulting with our experts or participating in our new technology events. Our team has a firm commitment to relationships, and an unflinching focus on innovation through technology. Visit our partners - contact us today. Campion Sales believes in helping companies embrace best-in-breed Security Technology that empowers our customers for success. Our team provides system design services and demos to integrators and consultants. We can help, give us call today. Campion's Technology Showcase was founded to keep uptodate on the ever changing, rapidly growing, need for sophisticated Security, Audio and Video solutions. 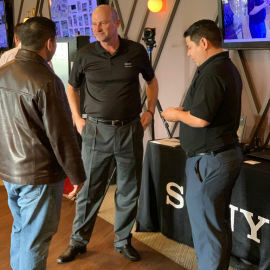 We are proud to represent the Top Technology Innovators - Look out for a fun day to learn and see the latest technology at a CTS 2019 event near you. Call for a CTS 2019 events schedule. 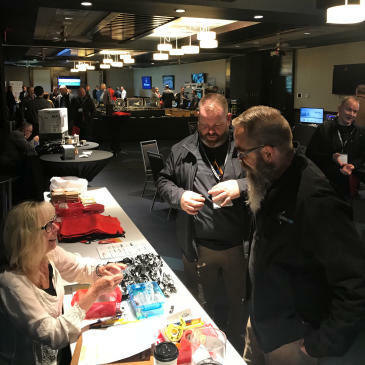 Campion Sales is excited to partner with industry leading manufacturers for our annual technology events hosted at TopGolf. The focus for this event: How To Utilize IP Security Effectively Today and in the Future. CTS 2019 Houston and CTS 2019 San Antonio were fun and succesful events. Call us for more information. As well as what we have been doing in the region, what we have been lacking is feet on the street and more localized face-to-face training with our customer base. Campion delivers all of that for us with their proven sales force and sales strategies; plus, this gets the BCDVideo brand into new customer opportunities with the combined breadth of our two product lines.